As I and Dr. Bheenaveni Ramaiah (Assistant Professor of Sociology, Osmania University), one of my relatives, my Driver narrowly missed a major murderous attack at Parakal, Bhupalpally district on 23/9/2017 by the Arya-Vysya forces at 4.45 pm. In this context, I am issuing this statement. They were about 30 and more people with big stones in their hands at the Ambedkar statue at the road turning point junction towards Warangal. Some attackers started chasing my car hitting it from behind from Bhupalapalli onwards with hands. They would have attacked us at the Bhupalapalli red light cross. But my driver’s speed movement once the green light appeared saved us there. With a pre-plan a team was also waiting at Parkal. There also my driver took quick turn to the right drove to the nearby police station in Parakal with highest speed possible. The mob was also followed my car upto the police station. Thankfully all the police personal quickly covered my vehicle. The CI and SI really provided protection. The Arya-Vysyas tried to push themselves into the Police Station. They waited there till I gave the petition and started with two protection police vehicles. As the police followed us in two vehicles, as we reached Ghanpur, there were several Arya-Vysyas on the road to attack our car even when the police were there. There again the local CI protected with a great skill by taking us through village roads and could reach Hyderabad safely in the night at 10pm. It was a fear stricken travel. Ever since my effigy burning on 10th September, 2017 started I had to lodge three cases. Two in Osmania PS after Arya-Vysya leaders Ramakrishna and Ramana’s threats. The second one after the threat issued by TG Venkatesh MP, TDP and at also Parkal murderous attack. The national parties like Congress, CPM and CPI did not even condemn at the national level. The Telangana Congress, TDP and other parties were also silent. Only Telangana CPM and CPI condemned. The ruling TRS and BJP were all the time supporting the Arya-Vysays and abusing me on the TV channels. No major human right activists came forward in my support within Telangana, quite tragically. In my two petitions at Osmania I requested for strong police protection at my house. That is also not provided. I am losing faith in the constitutionally guaranteed freedom of Speech also. 1) Till 4th October, 2017 end I impose a Self-House Arrest myself and remain at Home. If I need to go out on personal needs like (medical and other) I will inform the Osmania Police Station. 2) I remain silent for all the media networkers of the State are concerned. If they are national or international by appointment I may speak. That is also in good faith. I thank my driver and the police officials involved in my protection. I am sorry for your plight. I deeply respect your integrity and courage, and so I symbolically stand with you. You have lots of support from others and not just me. We wish you all of the best in outcomes since you have the inner strength of character and convictions to follow that which is just, right and moral even when hard to do so. Accordingly, you are a real hero, and deserving of all of our care and support. It is a sad state of affairs indeed.However I have some observations to make. When the whole society is stuck with caste feelings,why only vysyas are criticised. Secondly vysyas are more docile compared to other upper caste Hindus. If u are working for the dalits u should come out with ur policy document and put it in the open forum and get approval from right,and like minded people.It is bigger game and may yield fruits in the long run. I appeal to university teacher’s association (AIFUCTO) to condemn the communal forces behind attack on you. I am a retired Professor of Economics. This is highly condemnable, a crowd of hundred or more chasing Prof. Kancha, holding stones with a murderous intent speaks volumes about where this so called “democracy” is heading. Like Mr.Kancha I am too particularly aghast and pained at the wanton silence of the so called National Parties, specially the the left, whom we consider as our natural allies in the fight against obscurantism and fundamentalism and in the fight for social justice and equality, but their laid-back passivity is indeed debilitating. We should not let one more drop of blood to shed, we have enough martyrs, Prof. Kancha is too precious to be lost. We stand with you Prof Kancha Ilaiah you are not alone, we will not allow these politically illiterate goons to take over the law into their hands. It was Mr. K Ilaiah who tried to provoke a community by writing some absolutely derogatory stuff against them, The content is totally baseless and is of utmost no use to the society. Being in such a responsible and noble profession, he should learn not to poke into some bodys nose. Unfortunate that today’s kids are being taught by such irresponsible prof’s. A matter of national shame. Kancha has got threats before. Why didn’t the Telengana government intervene immediately when the casteist threats started? Why haven’t instigators not been booked? Are there two laws in our country: one for upper caste hoodlums backed by the state, and second for the Backward Classes whose rights have been “frozen” for decades? It is high time that the secular parties took up these issues along with oppressed strata and castes in civil society. Statements are not enough. A price we all need to pay for standing up for justice and for people atlarge. Kancha Ilaiah was honest in his thinking and writing. A brave citizen of this country, an ideologue and competent societal commentator. He needs protection as well as support from the state as well as his friends and well-wishers at this time of his tribulation. this is indeed to hear that extremist are so open to end pretegious scholars of social medcinie. I am more disturbed by reading that no so called custodian of secularism and champions of human rights came forward to speak against such a gundaraj culture. Do they really wait or till the person in target is killed then only they will come out in speak agaist XYZ terror organizations mushrooming here na there. A life like Gauri Lankesh, Dabholkar, Pansare who cudnt survive attack and just survived Prof. Kancha Iaiah is more impportant than party or organizational agenda in the contemporary social unrest. if voices like them will be silent than we must expact that we can build a prograssive and socially cohesive society. 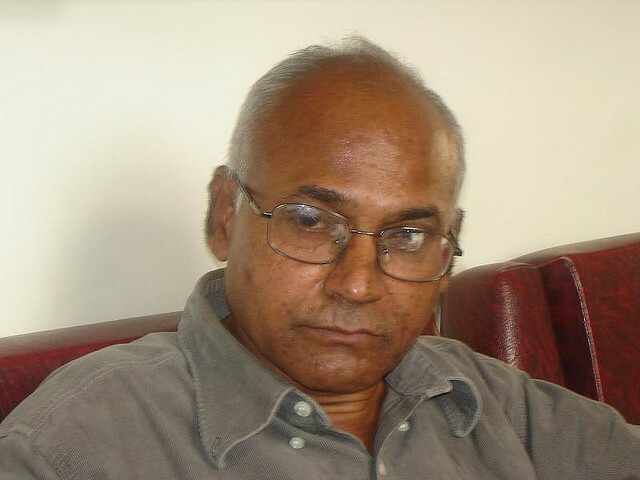 more than attckers I conddemn the those forces are are mute on such a tragic attack on Prof. Kancha Ilaiah. We must stand by KANCHA ILAIAH, not only for his safe life but also for his scholarship and his stand for victims of voilence of all types. Sir we pray as well spread awareness that your life and freedom in in acute danger, All must come together for you before that those terrror forces reaches you again. I am street singer from maharastra . I condemm attack on you. I will talk to ambedkarit people in mahastra to suport you . Tc. Sir!!! the same force have killed dabholkar , pansare , kalburgi and lankesh now they are after you. There is life threat to many people in mahastra . My mame is also in list. Sir i met you once . I was working with gaddar. Thanx sir!! Dear Sir, Your book, Why I am not Hindu, enlightened me a lot when I was a college student. I thought our society will gradually progress and prosper. Unfortunately, it is not happening and, sadly it is moving in opposite. And, that is sad truth.